There is an inevitable temptation to compare the Danish producer, songwriter and performer Lydmor with her compatriot MØ. In some ways they are not dissimilar. Apart from sharing the same nationality, they are about the same height and build and both are – usually – blonde. Other than that they are a different smorgasbord altogether. 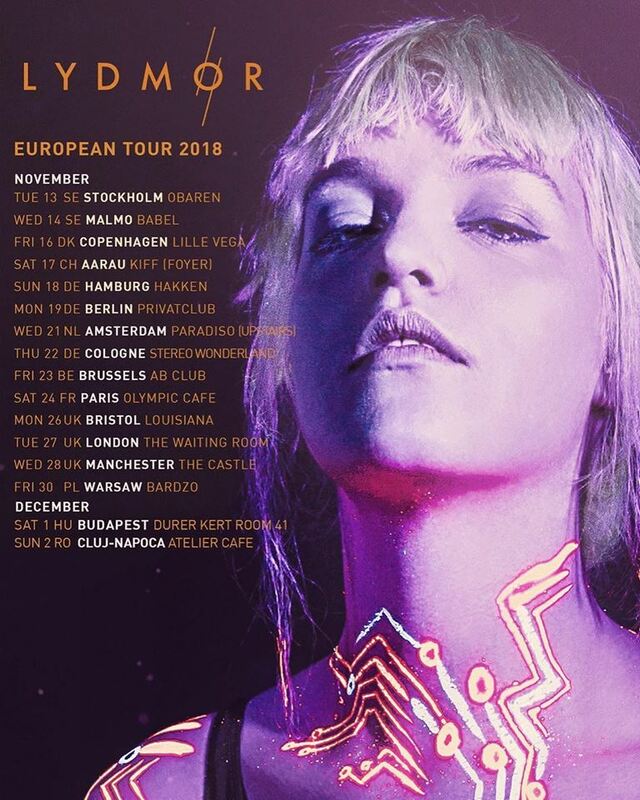 If you aren’t too clued up about Lydmor, that’s because she’s been under the radar here, as both of her first two albums (2012 and 2015) were released only in Denmark. Then, after getting herself in a bit of a personal mess, bad relationships and what have you, she decided to relocate for a while, away from Copenhagen. Not back to Aarhus, where she started out in the electronic underground scene. Or across the Øresund Bridge to Malmö and Sweden, in the footsteps of Saga Norén. No, her personal slogan reads that she is “blending into space, in a place far, far away”. So she packed her bags and decamped to…Shanghai, without being able to speak a word of Mandarin or any other Chinese language and where she knew no-one. Her many experiences there, and the people she met, are chronicled in her first international album, ‘I told you I’d tell them our story’, released in September and songs from which most of tonight’s set was made up. You can hear the Chinese influences in her rhythms. Over the years I’ve seen varying degrees of professionalism amongst the artists who play small venues like The Castle (100 capacity). Some artists and bands strolled through their set like they just came in for a couple of pints and were convinced by a mate to do a turn. Others, like John Metcalfe, played enrapturing performances right here as if they were at the Albert Hall. But I’ve never seen at first hand, up close and personal, anyone with the sheer chutzpah, the overpowering sense of purpose, as Lydmor. As her backing tapes exploded into life on a blacked-out stage she entered through the audience’s door (well, actually there’s no other way in) and strode right through the audience to the stage, ignoring the guy holding the door open for her (yours truly) as if he wasn’t there, like Wyatt Earp on his way to the O.K. Corral. There is something about Lydmor that tells you immediately “I am going to be a big name and I mean business”. Most of her performance was played out on that darkened stage. Sometimes she sings sideways-on, to her laptop, perched on top of her synthesiser, as if it were a dressing table mirror. At other times she addresses the entire audience and occasionally (how we wished it were more often), she comes down into the audience and directs her delightful personality right into the face of one of its members, moving from one to another as if she were contemplating members of the Terracotta Army. “My breasts are three sizes bigger” she intoned to one bemused, sweating male. Visually, she’s scantily clad, and covered in body paint in the form of long snakes that is only discernible under ultraviolet light (there are eight fluorescent tubes scattered around the stage). When it becomes visible the effect is powerful and stimulating. So is her music. While loosely falling into the chill wave category she is capable of upping the tempo rapidly, such as on what is probably her best-known song so far, ‘Claudia’, one that concerns “how a rich man changes a woman’s life but in the end she appears victorious”. A feminist manifest as she admits herself and one again possibly influenced by #MeToo, which must have landed in Shanghai sometime while she was there. Lydmor describes herself as ‘post-feminist’ and if she has an axe to grind at all it seems to be with flaunted material wealth. Chatting with her after the show I noted that at least three of her songs – ‘Claudia’, ‘Money Towers’ and ‘Helium High’ contain overt references to money and its abuse and ‘Claudia’ contains a wonderful line that she virtually spits out: “Behold money, I am woman”, a retort to the one a few seconds earlier, “Behold woman, I am money”. Behold a woman who can create and set a new agenda of her own. She does not merely write and sing about her angst either. She is a regular visitor to parts of the world that are not exactly dripping in wealth, such as large parts of Latin America. During the 12-song set it really came alive on four or five occasions when she moved up-tempo and shifted into dance mode (and she can dance, better than MØ). A couple of songs, notably the opener, ‘The Mansion’, didn’t really convince in this live setting but ‘Killing Time’, ‘Helium High’ and ‘Money Towers’ in particular most certainly did. Ergo, I’m tempted to say that sort of approach suits her best. But then towards the end she delivered a stunning, intense ballad – without a set list I can’t name it unfortunately – one she prefaced with the words “too sad, too dark” and which had the audience hanging on every word. If there is one song from ‘I told you I’d tell them our story’ which won me over instantly it is ‘Soft Islands’. It is quite extraordinary; two different songs rolled into one. It starts off as a spoken ballad then about halfway through you suddenly find yourself transported instantly to Amnesia in Ibiza at 4 am as Lydmor turns into a DJ. Not that I’ve ever been in Amnesia. As far as I can remember, anyway. I knew she traditionally closes with it (and she doesn’t do encores). So when she introduced the final song as “a long one” and that it was ‘I Love You’ I thought I wouldn’t be hearing it. Then, halfway through, it transitioned into the second half of ‘Soft Islands’ and I was well and truly sold on Lydmor. So, how to dim sum-up the Danish/Chinese concoction that is Lydmor? A nice girl; a fun girl with an unconcealed joie de vivre; but one with just a hint of attitude. Thoughtful, intelligent, caring. Totally focused. Slightly bonkers. I said I’d try to avoid comparisons with MØ, but who can you contrast her with? Well, a young Annie Clark, for sure. Sia too, and not just because she sings about a chandelier. But I’ll leave you with this one. I didn’t get to see Madonna’s first ever appearance in Manchester in 1984 at the Hacienda (this was Lydmor’s first time here) but I have seen the videos and if anything Lydmor’s performance was more dramatic. I suspect we will hear much more of Jenny Rossander in the future. Interesting review! Made me check up on her on the net – interesting!